We love Mexican food at our house. Love, love, love it. If it's my turn to choose where we go out to eat, I will almost always choose Mexican. I also love Chicken Tortilla Soup. 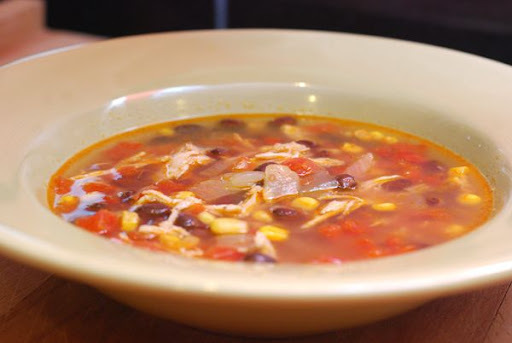 It's fresh and light and instead of chowing down on cheese dip and chips before horking down a burrito, enchilada, refried beans and rice, I'll often order a bowl of Chicken Tortilla Soup - just to keep the calories somewhere below 3,000 for the night. And, because I love the light, Mexican flavor that comes through in it. My sister first made this for me on a recent visit to her house, and I promptly came home and made a quadruple batch for my family. I now have 6 freezer bags full of it in our freezer, and we'll pull one out every couple of weeks. And, because it is so incredibly easy to make - you just dump a whole bunch of ingredients into a soup pot and simmer, I skipped over taking pics. I do, however, want to share with you one little secret that helps me tremendously when I'm making soups and stews. Typically, soup and stew recipes call for cans/cartons of chicken/beef broth. Because I often double or triple soup recipes, that's a whole lotta cans of broth. 1. I don't have the pantry space to store umpteen cans. 2. Opening that many cans with my ancient can opener is a killer on the hands. 3. Cans take up a ton of space in the trash can. Mainly, I just don't have the pantry space to store them, especially if I'm tripling or quadrupling a recipe for freezing. SO, I use soup base. You can find it right next to the chicken bouillon cubes and canned stock in the grocery store. One teaspoon soup base + one cup of water = one cup of stock. The small container above, about the size of one can of stock, makes 72 cups of stock! So, I never buy chicken stock (and I don't make it homemade - not in this season of life). 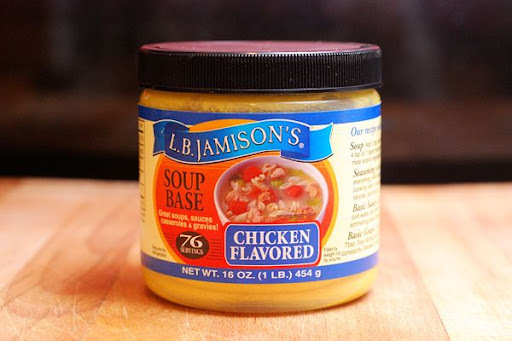 Anytime I need chicken or beef stock, I pull out my small container of soup base, and mix together what I need for a recipe. It's delicious. I think it tastes better than stock, and if I want to add more flavor without adding more water, I can add a bit extra to bump up the flavor. I love that. I used my trusty container of soup base to make two large stock pots full of this Chicken Tortilla Soup. I roasted chicken in the oven, but you could use a store-bought rotisserie chicken and shred it. That would make this recipe about the easiest soup you've ever made. 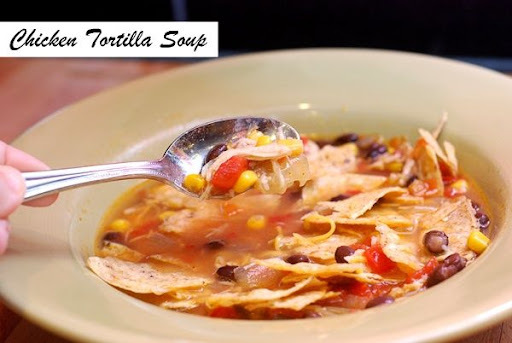 You can eat it as is, or just top it with cheese - if you're not big on putting tortilla chips in your soup. But, I gotta tell you, the tortilla chips give it this delicious flavor and crunch as you make your way through the bowl. Try it. At least once! 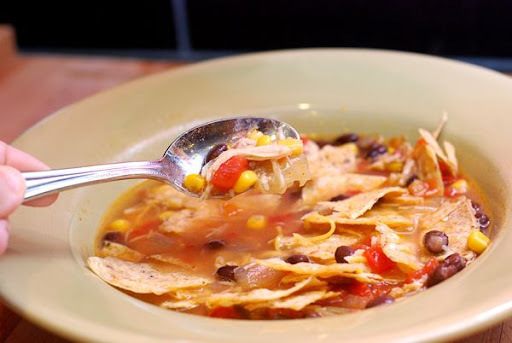 I hope you enjoy this delicious Chicken Tortilla Soup recipe as much as we do. In large pot, saute onions in olive oil for 10 minutes or until soft. Pour remaining ingredients in the pot. Mix and simmer covered for 20 minutes. Serve with shredded cheese, tortilla chips, and sour cream, if desired. i will be adding this to my shopping list today! i heart mexican food too and always order soup! Thank you Sarah!! I am making this for dinner tonight. It looks good and I have everything I need in the house. YUMMY! Mexican food is so good. Thanks for the recipe! YUM!! This sounds similar to a chili recipe I got from my sister - but her's doesn't have the chicken broth. Will be trying this one! this looks soooooooo good--i have a question in the recipie you say to use that little jar of goodness (what a great invention) but in the recipie it says stock? just curious---I cannot wait to try this! If you use soup base, you would just make up four cups of chicken stock and two cups of beef stock (one teaspoon of base + one cup of water = one cup of stock). But, you could use canned stock as well - whichever you prefer. Either is fine. Yum! Another great Short Stop recipe! You just keep sharing such yumminess with us. This looks delicious. Made it for dinner tonight! (Thanks for the early afternoon inspiration!) 4/5 of us loved it! The other fifth can't be counted. She doesn't like much. I made this for dinner last night and it was delicious! Definitely making this again. Thanks for the recipe. This is it! The tortilla soup recipe I've been searching for, just like I remember enjoying in the southwest...thank you!